If you’re in the area, then it’s worth popping into Goto Jozo for a couple of standing beers. But there in lies the problems with Goto Jozo – it’s a nice little place but the atmosphere is more conducive for a quick beer or two then leave. If there was seating then I would recommend Goto Jozo a lot more. The in-house beer I had was solidly made and with the whole place being non-smoking, and not having a table charge with prices including tax, it is also possible to have a few beers and come back with change from ¥2000, which includes some small tapas as well. The vegetarian readers among you will also be pleased to hear that the majority of the tapas is vegetarian but the menus are all in Japanese and there was no WiFi. Kyodo, just to the south west of Shinjuku station, doesn’t hold many happy memories for me – well the only memory it holds for me is suddenly getting called out to work there one day and not knowing where it is. So when the Patreon account voted for me to go to Goto Jozo, I was filled with dread. Thankfully, Google Maps and Hyperdia have improved a lot since then and have made getting to the places I want to go to a lot easier. Goto Jozo is located about a two-minute walk from Kyodo Station on the main Odakyu line out of Shinjuku. The bar opened up in 2016, and started life out as a bar before gaining their brewing license in September 2018 after a much complicated and convoluted process. It’s hard to miss the brewery as it’s next door to the bar itself and is surrounded by glass, allowing people to look in. 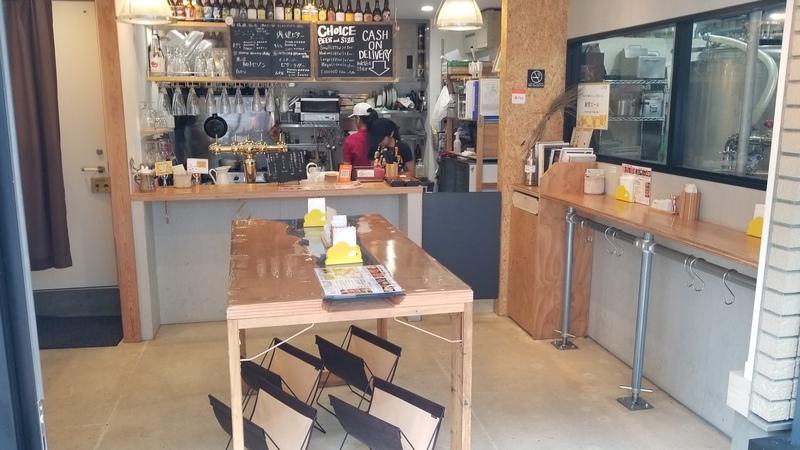 The whole place is standing only, which means no table charge but also means that after an hour or so, if you’re over 5′ 6″ (167cms), you’re going to find the tables and counter area a bit low to be leaning on for such a long time. Goto Jozo is also non-smoking as well, both inside and outside at the lone barrel. There are four taps of craft beer on at Goto Jozo, with the taps being split between in-house brews, and also guest beers. The prices for both are the same, regardless of strength or brewery name. Small beers (275ml) for ¥500, medium (385ml) for ¥800, large (580ml) for ¥1,000 and mega (1,160ml) for ¥1,800. All the prices include tax and also makes Goto Jozo one of the cheapest places to get some large or bigger beers in. Even the small beers at ¥500 are good value. There is also a takeaway option of a 420ml plastic cup for ¥800 yen if you’re like me and can’t wait for the next bar to get a beer in. There is also a happy hour on weekdays from 3pm to 5pm where you can choose any three small beers for ¥1,000yen – a nice little bargain there! Due to the standing nature of Goto Jozo, the majority of the food is tapas style, with a heavy leaning towards vegetarian style dishes. The food ranges from simple salads to some fried bits and pieces though it isn’t filling enough to have one portion. Definitely eat before coming here or be prepared to spend about ¥1,500 on being reasonably fed. The menus were in Japanese only with the staff speaking only rudimentary English, so make sure you have your Google Translate out to help you. The closest station to Goto Jozo is Kyodo Station on the Odakyu Main Line. The brewpub is about a two-minute walk from the station. Rob, if I may correct you; according to the sign you photographed (..125825.jpg), it appears the happy hour is from 1500 to 1700 hours, which is 3:00 – 5:00 pm for those unused to 24-hour time. While this may be upsetting to a few, it does illustrate the venue is open for daytime drinking, and with a bonus!